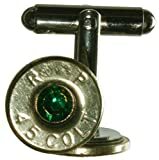 If you're a gritty gunslinger by day and a dashing, debonair gentleman by night, subtly add some firepower flair to your attire when you don these cool new Colt .45 Cufflinks. These stylish caliber cufflinks are constructed from actual spent Colt .45 rounds that were cut, polished, and assembled by hand in the USA. 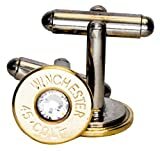 Don't worry, these unique cufflinks are completely safe, since the bullet, gunpowder and primer are long gone, but I'd avoid passing them through any security metal detectors unless you're looking for trouble, punk. Size: 0.5" diameter x 0.3125"